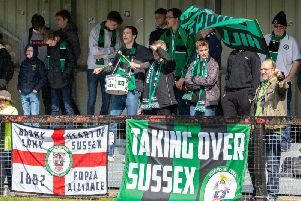 Burgess Hill Town assistant manager John Rattle wasn’t overly impressed with the performance from his side during Saturday’s 2-1 win over Corinthian Casuals. But he praised the mentality of his players as they ‘hung in there and rode a bit of luck’ to come from behind to claim all three points with two late goals from Boris Kipeya-Bonno and Tommy Wood. The Hillians followed up their win at Merstham with a hard-fought victory last weekend, but Rattle admitted they were far from their best and will need to show more in the remaining games of the season. But he knows that in order to achieve survival they have to be better going forward. Rattle recognised that despite the win Burgess Hill were below par against Corinthian Casuals. He said: “Performance-wise we were disappointing. We weren’t at our best”. However, Rattle remains confident that his side can improve on their recent performances and do enough to stay up come the end of the season. Rattle added: “We have to be confident. I said it a couple of weeks ago, if we win all our games, we’ve got a chance. We’ve set our target as a group and that’s what we’re aiming for. We’ve just got to look to pick up as many points as we can”. The Hillians host Brightlingsea Regent next time out on Saturday April 13 at the Green Elephants Stadium, and Rattle is desperate to ‘keep the momentum going’ after his side’s recent upturn in form. He is hopeful that Pat Harding and Farrell Ryder can both be back in contention for the 3pm kick-off as The Hillians look for their third consecutive win in what is proving to be a fascinating run-in in the Bostik Football League Division 1 South East.